Sarah is regularly invited to visit primary schools and nurseries across the UK. She is very flexible and will work out a plan for her visit to that particular establishment, depending on what has been asked of her. Sarah In The Midst Of A Skype Visit To A Primary School In America. “Having Sarah visit was a great experience for our children. Sarah’s assembly not only introduced her books and characters, but also introduced her career as an author which our children found inspiring. The workshops were creative and engaging for the children and Sarah was very flexible and professional, to work with a range of different groups, in order to meet the needs of the children. The highlight of Sarah’s visit was when a reluctant reader left school at the end of the day, only to return a few minutes later with money to purchase one of Sarah’s books. Other childen have also requested the books in our library and have realised that writing can be magical! Thank you Sarah for a great day.” Mrs.G.Hodgson – English Leader at Wyberton Primary School, Wyberton, Lincolnshire. “The staff and children alike, were inspired by the fantastic workshops that they took part in. The children enjoyed talking to and meeting a ‘real-life’ author and quickly warmed to Sarah’s enthusiastic and friendly personality. 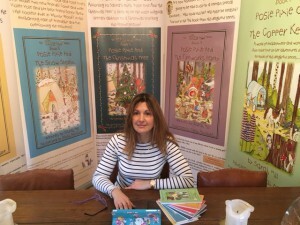 The Whimsy Wood stories were brought to life in a fun and imaginative way and we are already looking forward to planning another visit.” Mrs.T.Brown – English Co-ordinator at Staniland Academy, Boston, Lincolnshire. “Firstly, I would like to personally thank Sarah for her efforts on World Book Day 2016. It was a fantastic experience from start to end! Communication prior to the school visit was exceptional, with a comprehensive plan of the daily activities outlined. The whole school assembly and following workshops were both professional and engaging. The activities for key stages one and two, as well as Reception children, were pitched appropriately and offered all pupils the opportunity to learn and take part in a range of creative writing and storytelling tasks. Our staff were very pleased with Sarah’s enthusiasm, professionalism and general rapport with the children. Thank you for efforts.” Mr.T.Konsek – Year 3 teacher, Our Lady of Perpetual Succour Academy. “We were all excited that an author was coming to visit our school. Her ideas and imagination were incredible and so good that it inspires me to be a writer when I am older. She uses a very interesting snakes and ladders method to think of her stories.” Alan aged 10yrs. “When Sarah Hill came we were all very excited. She has a very adventurous mind and is really clever! She gave us some advice on how to be a good writer and how to use your imagination. Sarah Hill also told us how she became a story writer.” Sally aged 11yrs. “I liked it when Sarah Hill told her stories and when she explained her imagination to us. We liked it when she told us about being a vet and when she had a baby. It was cool when she dressed up as a fairy with wings and a fairy hat!” Abby aged 6yrs. “We enjoyed Sarah Hill’s visit because she had so much enthusiasm with her activity. We liked it when she had different characters in each book. Sarah was really nice to everyone which made us feel happy. We liked it when she said loads of positive things about your imagination. She was very child-friendly because she had a whole load of books for children and she also said she would have a book out for older children (9-10 years) which I would like to read!” Alex and Blake aged 10yrs. 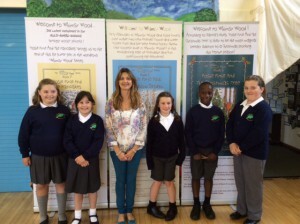 “Our children really enjoyed Sarah’s author visit. 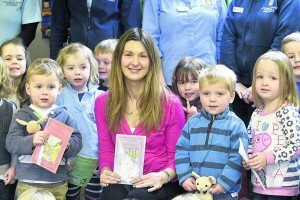 She read with enthusiasm and humour, engaging the children throughout. All our children were mesmerized and inspired to read more of her stories.” Mrs.R.Palmer – Assistant Deputy Headteacher, Corsham Primary. 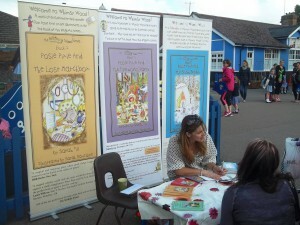 ”Sarah Hill, author of The Whimsy Wood Family series of books came to visit us today, as we started Book Week! We had a fantastic morning, Sarah led an inspirational assembly and then read to KS1. KS2 enjoyed a creative writing class with her, designing their own characters and woodland adventures. Thank you Sarah, we all had a amazing, creative morning.” Rowde Primary Academy, Rowde, Wiltshire.